Market Basket has changed its policy regarding deli bags after complaints on social media from Londonderry's town manager and New Hampshire Gov. Chris Sununu. A complaint by a New Hampshire town official may have led Market Basket to change a policy at the deli counter. 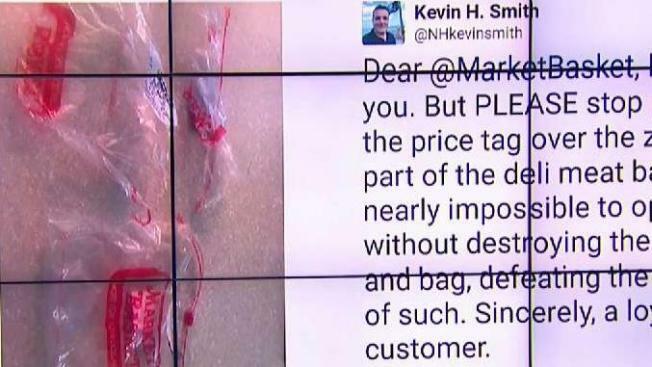 Kevin Smith, the Londonderry town manager tweeted earlier this month to the Tewksbury-based supermarket that he was frustrated by the price stickers always being placed over the zipper of his deli purchases. The practice made it impossible to open the items without destroying the bag. Smith's frustration was shared on Twitter by Gov. Chris Sununu. Market Basket responded to both loyal customers apologizing and saying they would speak to their deli departments. On Tuesday, both Smith and Sununu were pleasantly surprised when they went shopping and found that the stickers on their deli bags were not placed over the zip locks. Sununu celebrated with a grilled cheese. NBC10 Boston has reached out to Market Basket for comment.